Welcome to Day #3 of Chocolate and Mint Theme Week. And, Happy World Chocolate Day in Europe/UK. 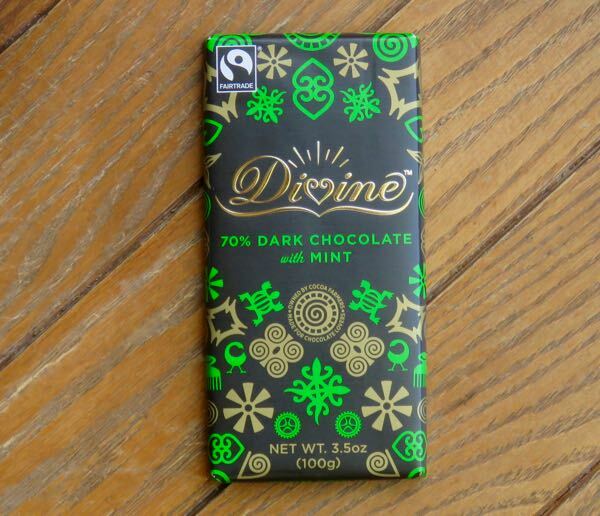 Today's Divine Chocolate 70% Dark Chocolate with Mint bar was made in Germany with Fairtrade cacao beans from the Kuapa Kokoo Farmers co-operative in Ghana (West Africa), and distributed by Divine Chocolate Inc. (Washington, D.C.). This was a true international bar. The chocolate had a smooth, almost creamy texture, likely from a bit of added cocoa butter. The taste of tiny natural peppermint crisp pieces was authentic, pleasing, flavorful and even throughout the bar. An earthy dark chocolate flavor kept poking through the natural mint; otherwise the base chocolate was smooth in flavor as well. 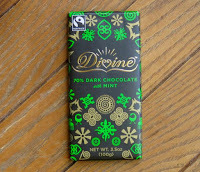 Like other Divine Chocolate offerings, this dark mint bar was attractively packaged. 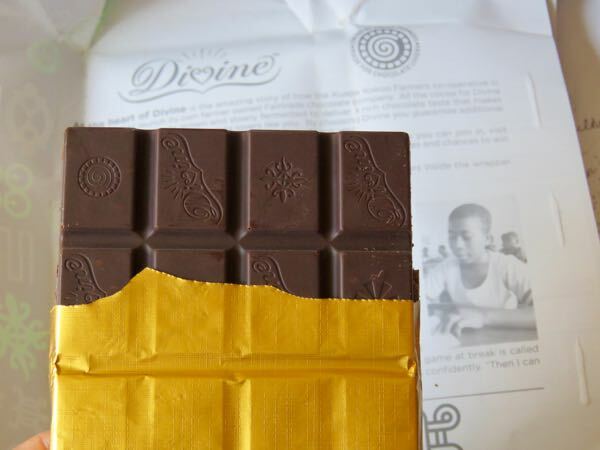 The inside of the outer packaging, printed with colorful Adinkra (West African)-inspired symbols* contained educational information about the people/farmers behind the beans. Inside this outer wrapper the bar was covered in gold foil. Labels: 70 percent, chocolate and fair trade, chocolate and mint, chocolate and peppermint, dark chocolate bar, Divine Chocolate Inc.